An Israeli spacecraft attempting to make history by becoming the first privately funded craft to land on the moon suffered an engine malfunction during its descent and crashed onto the lunar surface. "We didn't make it," SpaceIL chairman Morris Kahn said during a livestream of the landing attempt. "The achievement to getting to where we got is really tremendous." If successful, Israel would have become the fourth nation — after the United States, Russia and China — to land a spacecraft on the moon. Beresheet — the name means “genesis” in Hebrew — performed a final pre-landing maneuver Wednesday, firing its engines for 32 seconds to bring it within 10 miles of the lunar surface. During the landing attempt, the four-legged craft, about the size of a washing machine, beamed back a "selfie" from an altitude of about 14 miles above the lunar surface. 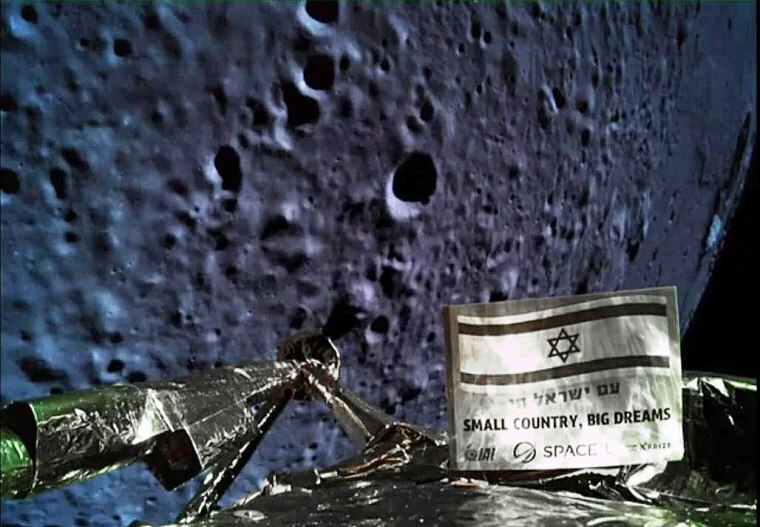 Against a backdrop of the moon's pockmarked surface, the photo showed one of the space probe's legs and a view of a plaque emblazoned with Israel's flag and the words "Small country, big dreams." The $100 million spacecraft had been expected to touch down on a vast lava plain known as Mare Serenitatis, or the Sea of Serenity, on the lunar nearside. This site is a few hundred miles east of the Apollo 15 landing site and about the same distance northwest of the Apollo 17 site, according to the Israel Ministry of Foreign Affairs. The Beresheet lander was designed to snap photos of its surroundings on the moon and use its onboard magnetometer to measure the magnetism of lunar rocks. Beresheet launched into space aboard a SpaceX Falcon 9 rocket Feb. 21 and slipped into lunar orbit April 4. The Beresheet mission was originally developed as part of the Google Lunar X Prize competition, which challenged privately funded teams to land a robotic spacecraft on the moon, drive it at least 500 meters and send photos and videos back to Earth. The contest ended last year with no one winning the $20 million grand prize. But on Thursday, Peter Diamandis, the founder and executive chairman of the Culver City, California-based X Prize Foundation, which sponsored the competition, said the organization will award $1 million to SpaceIL to continue its work.